Adjective Phrase | What Is an Adjective Phrase? What Is an Adjective Phrase? An adjective phrase is a group of words headed by an adjective that modifies a noun. She had extremely menacing eyes. 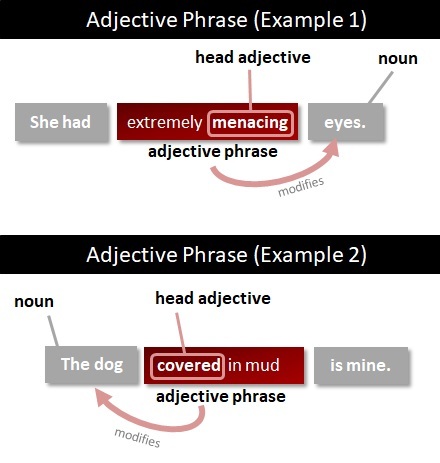 Like a normal adjective, an adjective phrase can be used before the noun it is modifying (like in the first two examples above) or after the noun it is modifying (like in the last example). My mother was fairly unhappy with the service. Her baking always smells very tempting. The consequences of agreeing were far too serious. An adjective phrase can be an attributive adjective or a predicative adjective. When an adjective appears before its noun, it is very likely to be an attributive adjective. However, an adjective that appears after its noun can also be attributive.